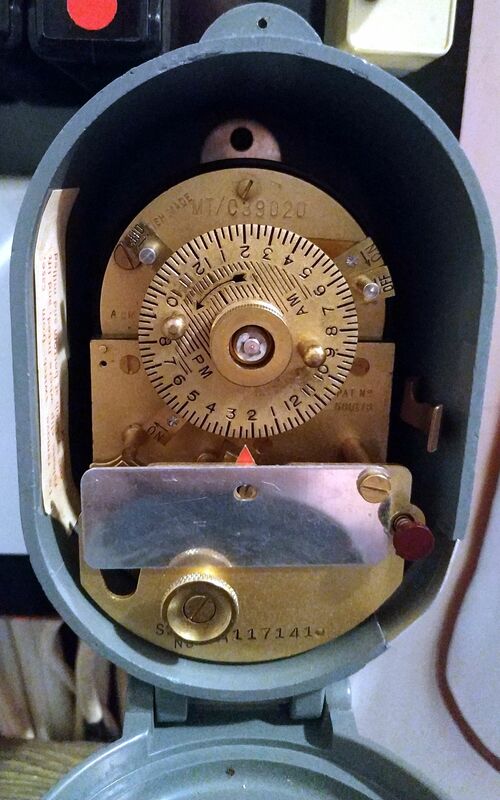 This video features three Venner time switches, the first of which is a small plastic cased Vennerette timer from 1969. This is a basic 24 hour timer with two on/off periods per day. Next is a Venner Auto-Point, a similar 24 hour 2 period timer mounted into a large plastic enclosure with a BS1363 socket outlet. Intended to be wall mounted, or onto a panel of some kind. Used for switching a single item on and off, such as a portable lamp or heater. The third timer is a model MSOP in a metal case with glass window. Dated 1962. Intended for lighting, with a 24 hour dial and a single on/off period. The switching times adjust automatically throughout the year, hence the additional month wheel in the centre of the dial. 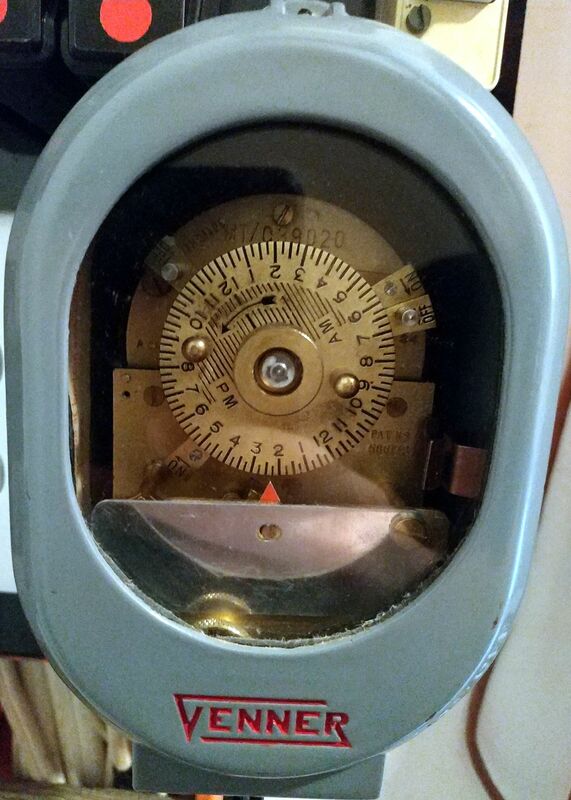 Scanned instructions and photos of another Venner metal cased timer, this one still in use. Photos and scan from Tyler A. 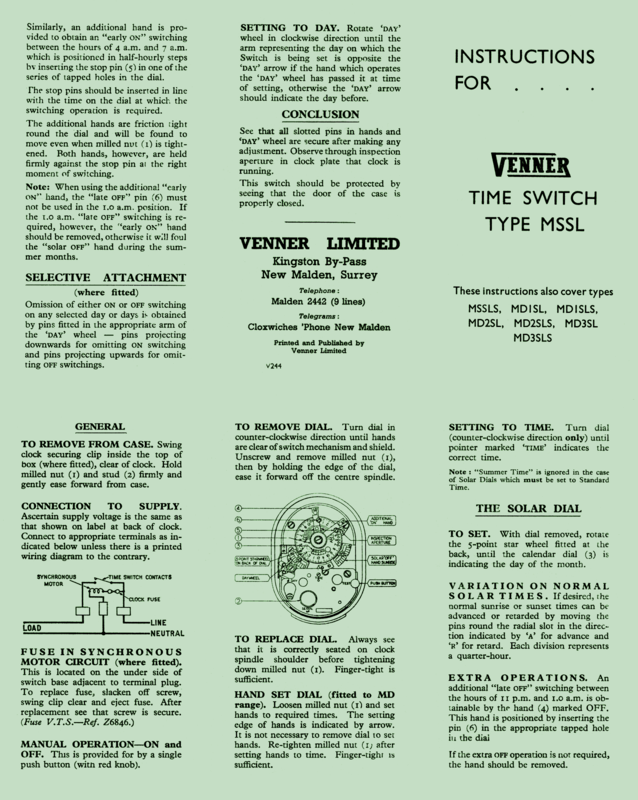 Instructions for the Venner MSSL, MSSLS and several MD series models. Includes setting the solar dial for automatic on/off adjustment of the times.